Help! I'm locked out of my account. What do I do? Don't worry! Your account will automatically unlock after five minutes. The security of your account is of the utmost importance, and the MINDBODY® app has protocols in place to guard against "brute force" hack attempts and password guessing. 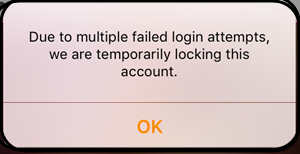 For this reason, we'll temporarily lock your account after five successive failed login attempts. How long until my account is unlocked? Your MINDBODY app account will be automatically unlocked after five minutes. How can I get back into my account before the 5 minutes is up? Neither MINDBODY nor your local business can lift this lockout before the 5-minute lockout period is over. Resetting your password also does not impact the lockout but resetting is still recommended if your password is not recognized.